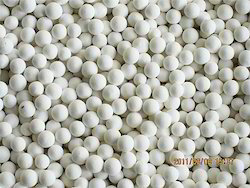 Prominent & Leading Manufacturer from Vadodara, we offer activated alumina. Product Introduction: The products is colorless sphere ball, insoluble in water and organic solvents ,soluble in strong acid, strong alkali solution with the property of high strength, not splitting after absorbing water, excellent thermal stability and strong resistance of virtualization poisoning. desulfurization plants, petrochemical plants, the Claus sulfur recovery in chemical plants. Storage: Avoid damping and any adsorption of water or organic substance before use. Otherwise it must be regenerated.